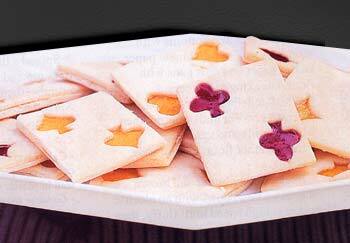 Recipe: Jam Filled Playing Card Cookies | Oh, for the Love of Vintage! In keeping with the theme of the previous post, Oh, for the Love of…Playing Card Novelty Prints, here is a recipe I’m about to try out for jam filled playing card cookies. Look at them, so sweet and hopefully very tasty! Preparation: for the full preparation and cooking directions visit Epicurious.com. Please note: the prep time is 2 1/4 hr and with the baking time that’s 4 1/2 hr total! These look SO great – very clever and perfectly executed. I think they look amazing…but the amount of prep and took time! Eghads. So I’ve put off making them for a while. « Oh, for the Love of…Playing Card Novelty Prints!